"It was like entering an obscure art gallery and stumbling across a Renoir". That was how British photographer David Coulson described for People magazine the wonder and astonishment he experienced upon first gazing at an engraving of two majestic 20-foot-tall giraffes carved into stone in Niger's Air Mountains -- among the largest prehistoric engravings ever found. Readers will share his awe in the pages of this breathtaking volume, the first comprehensive illustrated book on Africa's rock art from prehistoric times to the 20th century. 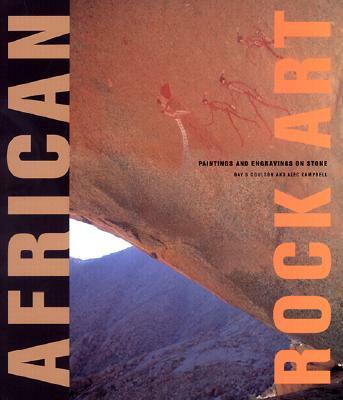 Covering the entire continent, this magnificently illustrated book contains more than 200 full-color photographs of Africa's rock art, together with historical and interpretive analysis. Coulson and former museum director Alec Campbell scoured the remotest areas of Africa in their efforts to raise public awareness of the variety, importance, and frailty of these extraordinary works, many of which are endangered by erosion, theft, and vandalism. Description: Internally unmarked and in very good condition. D/W with minimal edgewear, small closed tear to lower back spine fold (now protected in removable clear archival plastic cover).